During the show, enjoy unlimited fresh hand-tossed cheese and pepperoni pizza, salad, unlimited drinks (beer, wine and soda) and dessert. The Outta Control Dinner Show performs nightly. 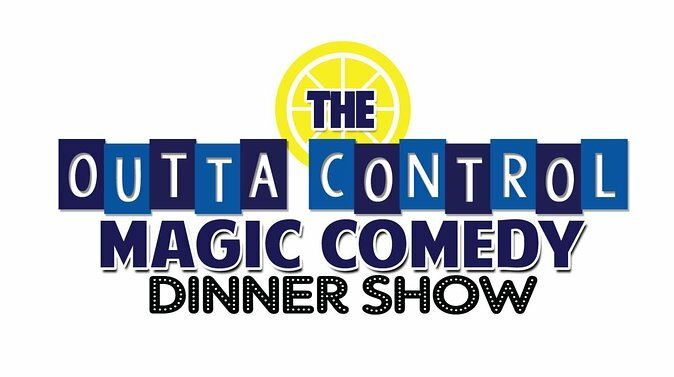 You can add excitement to your package by upgrading to the VIP Combo Ticket which includes The Outta Control Magic Comedy Dinner Show and admission to WonderWorks. WonderWorks is an amusement park for the mind! Featuring over 100 interactive exhibits for visitors of all ages to experience. Experience 74MPH winds of a hurricane, lay on a bed of nails, play virtual sports, land a space shuttle, make and ride your own roller coaster, and much more. Also included with admission are the 4D theater, glow-in-the-dark ropes course, and 1 game of laser tag. Make sure to wear closed toe shoes for the ropes course. Earthquake Simulators - One of history's most renowned earthquakes, the 1989 San Francisco earthquake that stopped baseball's World Series and collapsed a freeway is recreated in the laboratory. Guests will feel for themselves what an earthquake that measures 5.3 on the Richter Scale actually feels like. Hurricane Hole - Guests will feel the effects of winds reaching 65 miles per hour. According to the Saffar-Simpson Scale, the hurricane in this simulation is merely a mild one! Anti- Gravity Chamber - Water is traveling from the floor to the ceiling, or is it? At the touch of a special button that you control, water will appear to change direction! Look up! The change in frequency of the strobe lights is what causes the water to appear as if its directional flow has changed. Famous Disasters - Twenty-five feet of computers and monitors present dramatic footage of some of the world's most famous natural disasters. These disasters are explained in basic scientific terms and guests have the opportunity to quiz themselves about what they've learned! Virtual Hoops - Utilizing the magic of blue screen cinema technology, a computer places the guest's image on a basketball court where he/she faces a challenge from a much taller defender. Others can watch on the "big screen" as guest's attempt to score as many hoops as he/she can. Bubble Lab - Kids of all ages (1 to 101) love bubbles. This gallery is JUST FOR THE FUN OF IT! Visitors will be able to make giant bubbles, large enough to encapsulate a person. Velocity Tunnel - Guests will see for themselves just how fast they can hurl a ball in the Velocity Tunnel. The best part is you choose a major league baseball player to pitch to. How fast was the speed of your pitch? This exhibit introduces the relationships among gravity, speed, and distance. Bed of Nails - Visitors will feel the sensation of 3,500 sharp nails while they are being elevated on this bed . In order for your skin to be punctured by a nail, 2 kilograms of pressure is necessary. A person weighing 70kg (154lbs) will be supported by approximately 1500 nails. This will result in an average pressure of 0.04kg per nail, which is less then the pressure required to do damage to the skin. WonderWall - The WonderWall will allow you to create a 3-dimensional impression of your entire body by pressing into this wall made of 40,000 plastic pins. Big Piano - Adults and children a like will create music with their feet. Jumping from key to key on this huge floor piano! Shadow Wall - Guests can leave their shadows behind in this unusual experiment. Through phosphorescence, this exhibit retains guests' images on a special wall for several minutes. Guests will stand directly in front of the wall and block bright light from reaching it. While the rest of the wall quickly absorbs the light, the area blocked by the guest remains dark, even after he/she walks away. Risk Zone - Do you consider yourself a high-risk taker? Do you believe in luck? Interact with the risk exhibits and learn about chance, probability and odds. Shuttle Landers - Visitors will use their hand and eye coordination to maneuver the controls of the NASA spacecraft to make a landing on the airstrip. Fighter Jets - Guests will discover the freedom of flight while taking a seat behind the F14 and F18 Fighter Jets to pilot their way across the blue skies or onto the carrier. Race Machine - Everyone is surrounded by diversity. What if we could change your ethnicity? In this exhibit guests will be able to morph their face into a different race. Computer Aging - For those who have wondered what they would look like in 25 years, this exhibit will give guests a glimpse of the future. The computer will take a photograph of their faces and change their appearances according to the age they select. Wonder Coaster - Explore the latest in virtual reality as you design the roller coaster you've always wanted to ride but couldn't find at any fair or amusement parks, then ride it! The WonderCoaster has the ability to turn 360 degrees in every direction.